Over 1,800 tourism professionals from more than 30 countries gathered last night, May 15, at the Cunard Centre in Halifax, Nova Scotia to discover what makes Atlantic Canada a compelling destination for travellers world-wide. ‘Atlantic Canada Night,’ organized as part of Rendez-vous Canada 2018, Canada’s signature international tourism marketplace, was a unique opportunity to inspire international travel agents and tour operators to consider Atlantic Canada for their clients’ vacations. This highly engaging, educational and fun evening was a great success, showcasing the region’s renowned maritime hospitality, world-class entertainment and fresh local food and beverages from each of the four Atlantic Provinces. The event provided the perfect opportunity for Atlantic Canadian delegates to engage, interact and lay the important groundwork for future business collaborations with international buyers. Atlantic Canada Night was made possible through funding provided by the Atlantic Canada Agreement on Tourism (ACAT). ACAT is a nine-member, pan-Atlantic, international marketing initiative comprised of the Atlantic Canada Opportunities Agency, the four tourism industry associations in Atlantic Canada and the provincial departments responsible for tourism in the provinces of New Brunswick, Newfoundland and Labrador, Nova Scotia and Prince Edward Island. Funding was also provided by Discover Halifax. 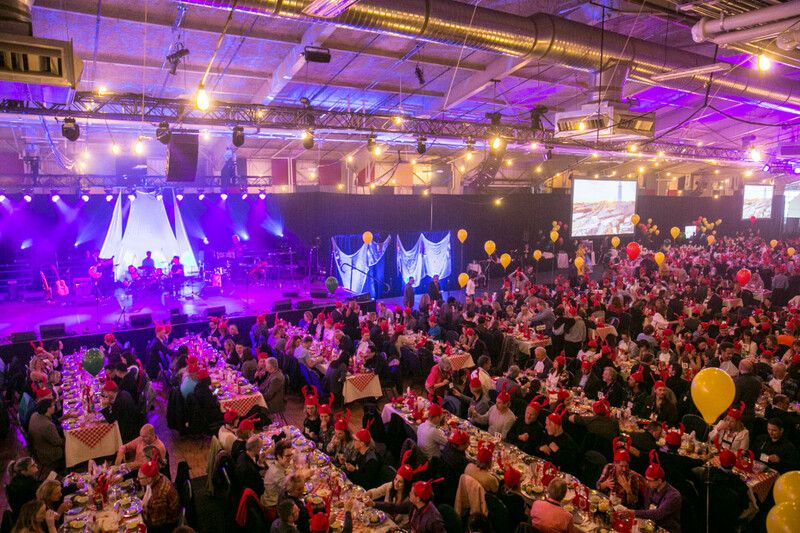 • Atlantic Canada Night was attended by over 1,800 Canadian and international tourism leaders and celebrated Atlantic Canadian culture, culinary fare, and entertainment, promoting travel to the region. • Atlantic Canada Night was held as part of Rendez-vous Canada, Canada’s signature international tourism marketplace, on May 15 at the Cunard Centre in Halifax, Nova Scotia. • Rendez-vous Canada is a four-day business-to-business marketplace that connects international travel trade buyers with Canadian tourism industry sellers through a series of one-on-one appointments, motivating travel to Canada. • Rendez-vous Canada takes place in a different Canadian city each year. This year’s event is hosted by Tourism Nova Scotia from May 13-16 at the Halifax Convention Centre. • Funding for the ACAT 2017-2020 is $19,950,000 and comes from the Atlantic Canada Opportunities Agency ($9,975,000) the four Atlantic Provinces (a combined total of $6,583,500), and the four Atlantic tourism industry associations (a combined total of $3,391,500). • ACAT’s mission is to promote the region and strengthen tourism in Atlantic Canada through coordinated government and industry tourism activities. • ACAT enables for the pooling of resources to create significant tourism synergies. The Agreement allows the four Atlantic Provinces to penetrate markets that are for the most part inaccessible separately and the opportunity to capitalize on emerging opportunities. • Discover Halifax is a non-profit, membership-based marketing and sales organization that works in partnership with the Halifax regional government, the Hotel Association of Nova Scotia, and participating industry members to promote Halifax as a destination of choice for leisure and business travellers. This entry was posted in What's New on 05/16/2018 by Colleen Bowes.